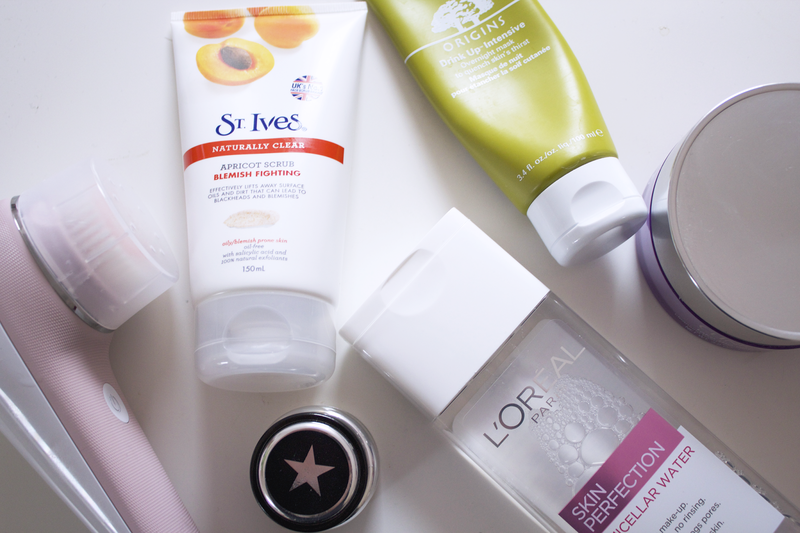 I've changed a couple of things in my skincare routine lately which has really improved my skin, I'm gradually getting rid of my acne scarring! Firstly, I have got rid of makeup wipes, I've heard so many times that they dry out your skin and aren't great for it so I bought the L'oreal Micellar Water. I use this with cotton pads to break down my makeup, it works so much better than wipes as I don't need to rub or pull at my eyes or skin and it's a lot quicker than using wipes. Next I use the Clinique Take the Day Off Cleansing Balm, I had always used my Origins Mega Mushroom Cleanser but ran out and decided to try something new. This is great if you have sensitive skin as it has no perfume and is very gentle on the skin, it has a lard-like consistency which is odd to put on your face but it works so well. It retails for £22 and you get a massive tub so it will definitely last a long time! Once I've rubbed that into my skin a little bit I use my Rio Sonicleanse Pure*, I was apprehensive about trying this as I had previously used the NO7 Cleansing Brush from Boots and it completely drained my skin of all the oils and made it SO dry, it was terrible. However this brush is amazing, it doesn't dry my skin out at all, it is so gentle on the skin so it is great for sensitive skin and it makes sure the cleanser is thoroughly cleaning my skin. I just use it on my forehead, cheeks and chin for 20 seconds each, it stops by itself so you only use it for 60 seconds. It retails for only £99.99 which is great compared to the price of a Clarisonic and it is such a great item to have! It isn't out yet but will be on the market very soon! Next I use the St Ives Scrub, this has been a staple in my skincare routine for years. It is brilliant to get rid of dead skin cells and makes my skin feel incredibly soft. I use the blemish fighting version as it is great for keeping them at bay but there are lots of different versions for different skin types. There are two masks that I use most often, the first is the Glamglow mask, I use this mainly for blemishes and blackheads but it is also great for adding radiance to your skin, it really draws out impurities. The other mask is the Origins Drink Up Intensive Overnight Mask, I've spoken about this too many times as I love it. I use this at night before I go to bed and when I wake up in the morning my skin feels so hydrated and any dry patches are completely gone! Nice picks! I'd love to give this glam glow a try. I've heard so much about it recently. St Ives scrubs are probably my favourite part of my skincare routine. They work so well and feel my face feeling like new. I love this article, thanks for sharing your thoughts with us!! I am regularly using Sakare's skincare mask products. I would strongly recommend this to all.